Here are the high-level concepts that I gathered. This is the perspective of a Web Strategist, an individual who is responsible for long term decisions of a website. After Facebook announcing it’s data sharing among the web community, it’s clear the web industry is going through an open garden type of change. By letting go, and using other groups data, a website has the opportunity to gain more value by saving development time and offering users greater access to information. 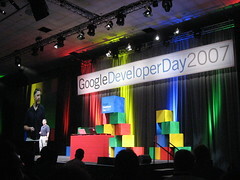 This keynote presentation by Jeff Baher was being streamed live to 10 cities around the world that were participating in Google Developer day. “Integrate, Reach, Build” was the theme throughout the day. Of course this means integrate Google APIs into your site. Which expands to a greater community of users, and building the new mixed, meshed, and mashed web. Sergey made a brief appearance, and I saw him holding a meeting with folks in the lunch room, he still gives us young entrepreneurs dreams and hopes. I quickly observed that information is leaving pure text and dual dimensions into new ways to access information. Google maps, and Google Earth and Sketcher provide multiple ways to access 3D information in our multi-dimensional world. I would expect some of these applications to start tying into GPS units in cars in the near future. Google is providing platforms, ones that have a structure that can be built on top of. Each of these can be built on top of. Google IG, Google Maps, Google Earth, and of course embedding any of the existing search components. Although search and search marketing and advertising still is Google’s bread and butter (85% of it’s revenue I’m told) it is clearly expanding it’s reach to other areas within the information industry. They’re clearly offering development tools, platforms, and data to sit on top of it, it is no longer just a ‘search appliance’. Components, Gadgets, and Widgets help a website be included in other aggregations such as Google IG, Many companies have created gadgets to embed in Google IG, such as Expedia’s trip fare planner. Google Gears is a browser extension for offline access. Works in all the major browsers and platforms. It’s an open sourced project. That allows data to be access offline, such as Google Reader. It may make sense for the info glut on a plane, but I’m online most of the time, and if I’m reading feeds, I’ll be so tempted to click on a post and leave a comment, you can’t do that while offline. It was interesting seeing the keynote speaker trying to get offline, it’s not easy! Google Data APIs – Read and write data to Google services including Google Calendar and Blogger. Google Gadgets – Write simple mini-apps for the Google homepage and Google Desktop. Google Gears – Develop web applications that work offline. Google Mapplets – Create mini-applications and layers for Google Maps. Google Maps API – Embed Google Maps in your own web pages. Google Web Toolkit – Write AJAX apps in the Java language. I got a tour of the Google Webmaster tools, I found the ‘incoming links’ data very interesting, the Google employee who showed me hadn’t even heard of Technorati, which is also interesting on many regards. Information (and thus marketing) has become distributed to smaller components, and the end results are amorphous, this means that web marketing is clearly NOT on your corporate website alone, and your information will be mixed into new forms. As always, this makes our job more difficult in finding where to be and measuring. Give your developers some time to explore some of these tools, and start thinking about how your organize could have a component into any of these platforms for extended reach. To Christine Songco of the Google Developer group who provided me and a media pass to this exclusive event. I look forward to other media events to cover. Greg (also a non-developer) has a write up.